The stories are all there, just waiting to be told – by you or me or whoever. 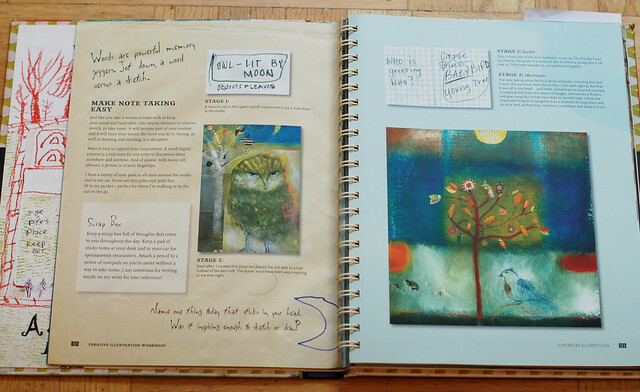 In her book, called Creative Illustration workshop for mixed-media Artists (seeing, sketching, storytelling and using found materials), artist Katherine Dunn talks about drawing what you love, something we need to be reminded of in the age of Pin-it-all. Katherine herself lives in a farm in Oregon and is surrounded daily by her favorite subjects: nature, the donkeys and her other farm animals. To me it’s a bit difficult to relate to what she draws, and to find my way into what I should be drawing, but maybe I’ll get there. What I love most about this book is her quirky drawing style, both humorous and mellow at the same time. 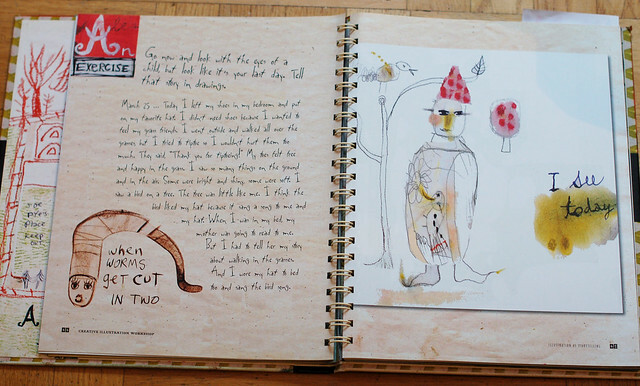 I also love how Katherine shows her process from the first jotted note, to sketch to finished drawing/illustration. Because her paintings are illustrations of her thoughts and the questions she is thinking about. Maybe all paintings are (or should be) storytelling in a way? Her sketches are rough and often made with charcoal, pencil or crayons, or just a written note to remember an idea by. There is a bit of collage, some writing prompts, lots of exercises to try and even ideas on how to use to scanner and layer a drawing using a computer. Yes, lots of yumminess. 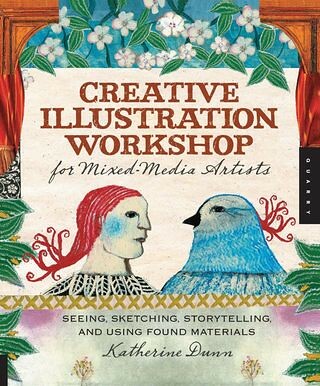 Personally I bought this book mostly because of a fascination with the way artist Katherine Dunn style of drawing. I’m a fan after reading the book, though I didn’t really get why I was so drawn to it at first. At a quick glance all of the pages are of naive, sketchy not-very-finished drawings. But with a closer look I see deeper than the surface… After browsing through a few pages I have the aha-moment! I get why I needed this book so much: I need to loosen up! I admire perfect lines way too much for my own good, and I have tried to imitate a steady hand for years! Instead I should be doing what I personally love and know much better, which is a kind of grungier, sketchier look. I’m now going to switch from black markers to pencil (and bring out my beloved charcoal pencils) and see what happens… I am sure that future art journal pages will have a wilder feel, and maybe even a painting on canvas will be born this year. We’ll see. The book itself i spiral bound with a hard cover to hide the spiral. It’s big, and lush and extremely yummy. It’s a keeper! Watch the promo-video (posted below) and see if you agree. Side note: Book promo videos are very cool in general if you ask me. I made my own promo video back in 2007 for my own book and it still makes me remember the day the first copy arrived… Good times. * Previous Book Reviews – all of iHanna’s book recommendations on one page! This entry was posted in Book Reviews, Draw & doodle and tagged generating ideas, grungy drawing, sketches. Bookmark the permalink. This is one of my most favourite art books. I love it so much. This looks like a wonderful book! I love her down-to-earth, “this is what excites me” drawings and thoughts. It’s wonderful and I think I may have to own it. Thanks for the review! I love this book! Her work is so fabulously imperfect and alive, very take it or leave it in my opinion. Well I’ll take it, thank you. 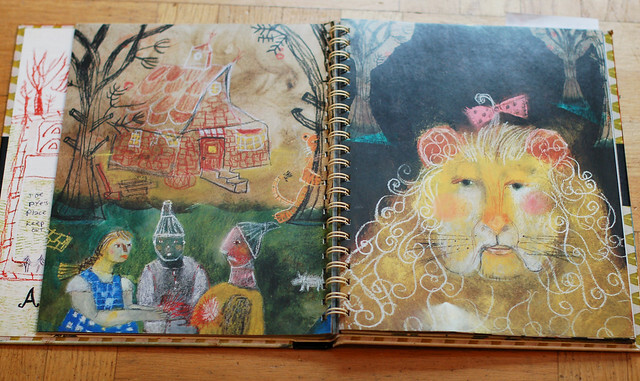 I also like how she makes stories from her everyday life into beautiful illustrations and paintings. She has a wonderful imagination and sense of humor. I am gonna buy this from adlibris. Seem s so inspiring! I have looked through this book a number of times, but never purchased it. Thank you for your review; I was interested to read what you learned from it, in terms of loosening up and drawing the way you naturally draw rather than struggling for a steadier hand. It’s a lesson I could stand to learn myself! An inspiring book. I loved the way she explains the process. She inspired me to be more loose and flexible in my first ideas and sketches. Not to think ahead but just play and explore. I always think too much about the outcome…. Even if you don’t like her style I would still recommend reading her book.